My Friend and I Sue are trying to be healthier. We are both vegetarians already. Being an avid food lover, I had always thought being a vegan would mean life would be miserable but I have been proved wrong. There are an abundance of websites, blogs and social networking posts dedicated to veganism including some fabulous recipes. This is something we could really get into. Its like a new adventure! We have also looked into raw food after being inspired by hearing about so many people who looked and felt great after the switch. I think this is a little way off for us as we need to take it one step at a time. We have been ensuring we have a raw juice at least 4 times a week. Today’s juice was Pear, apple, parsley, celery, cabbage and carrot. It was delicious. In fact whilst I am writing this, I think I will include posts on what the juice of the day was to share the goodness! For those of you who suffer from acid reflux, indigestion, discomfort etc, there are many great alternatives than to reach for the chalky pink substance advertised on TV. There are many reasons why these conditions occur – too much food, too much oil or fat, too many spices etc. Watch your food portions. Are you eating too much and then feeling uncomfortable afterwards? If so, look at the amount you eat. You feel like this because your digestive system cannot handle the amount of food intake and has to work hard to break everything down. Your blood and bile are working hard to digest your food so you feel uncomfortable and lethargic.Eat with the size of your stomach in mind and not your eyes. This is something that took me ages to grasp. I didn’t realise how little food I needed. Watch your cooking processes. Reduce fats and use variable methods like steaming, boiling etc. Or even better, keep a section of your plate for raw foods like salads and vegetables. Things like mushrooms, spinach, green beans, onions, garlic (if you can handle it) tomatoes, cucumber, radish, salad leaves, herbs etc are beautiful when eaten raw. After some practice, I have got used to the taste of raw garlic. I finely chop a clove and sprinkle it on the raw food on my plate and have no problems eating it. In fact I actually now enjoy the flavour – something I never thought I would. It also makes my teeth feel cleaner afterwards. I can’t quite explain this one! -Try not to have too much water/liquid with your meal. Your body secretes fluids to aid your digestion process and flooding them with liquids interferes with this process. So either drink 30 minutes before your meal or after your meal. Give bile and the other digestive juices a chance to go in and breakdown your food. –Ajawain or also known as Bishop’s Weed – is a great herb by many people in the East. You chew on about half a teaspoon of it after a meal. Within 10 minutes or so, I feel my food going down further and the discomfort lessens. Yoga Posture – Vajrasana. My friend Rucha told me about this one. It is very simple to do. After a meal, sit on the floor in the position pictured. 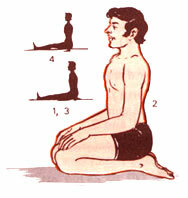 In the process of Vajrasana, one should keep the heels together and should possibly keep his spine erected. The shoulder and neck joints should be relaxed. The breathing pattern should be slow, deep, rhythmic and relaxed. This Asana helps digestion and eliminates gas trouble. This is the only asana, which, if practiced immediately after meals, stimulated digestion. -Essential oils from herbs such as peppermint, fennel, anise, cinnamon and ginger are a natural way to ease digestive symptoms from indigestion to constipation. So don’t just put up with it. Read up, get aware and get through it.